Have I ever told you I love to knit? And so I have…here and here and here. 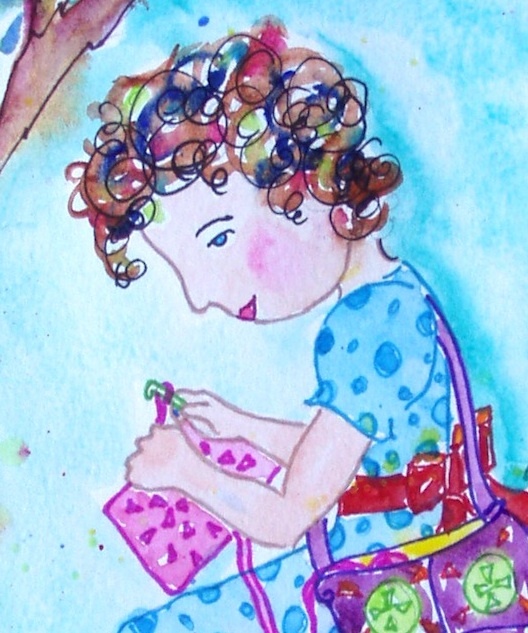 The only thing better than knitting, is to draw or paint what I’m knitting or crocheting. 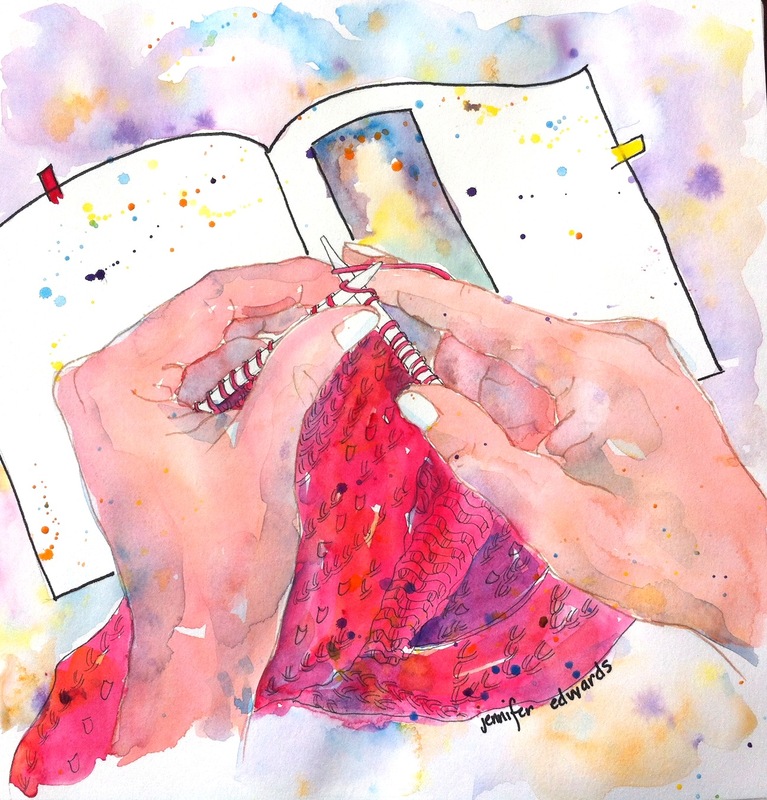 I loved making this little painting of my hands knitting a scarf. Mind you, this lace scarf was begun several years ago…but I have finished it! And I’ll give you a proper reveal soon! So here’s the photograph I worked from to create the above painting. I thought you might like to see the reference photo and how it gets translated into line and watercolor. I also thought you might like to see some of the projects I’ve been happily working on of late. I knitted this little cupcake hat for my niece’s one year birthday back at the beginning of March, the early days of my U.C. diagnosis. That’s my beautiful sister with her fifth child, Brynley. 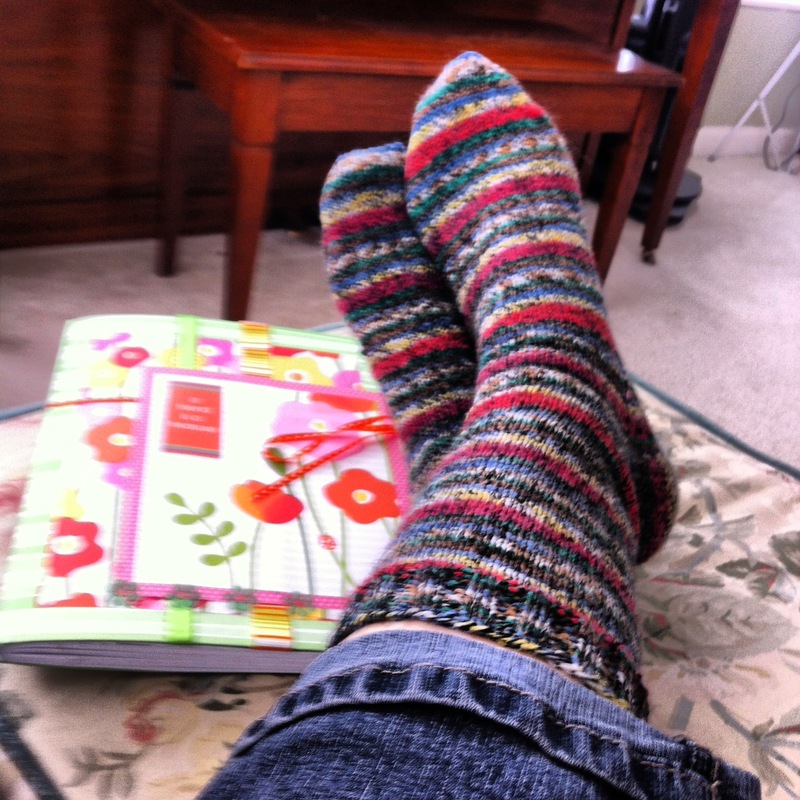 Then I finished this pair of socks, which I wore and wore through the chilly days. For some reason, I kept messing up on grafting the toe together. I’ve done the kitchener stitch successfully many times before, but a brain glitch prevented me from getting it right on both of these socks. Of course, I made it work somehow so the socks hold together without being uncomfortable. So, on THIS sock, finished just recently, I was delighted to work the Kitchener stitch correctly! Yay! Maybe my recent surgery re-worked my brain as well! And I love the colors in this yarn!!!!! This is a random photo of the basket of yarns I used for my Resurrection Shawl. 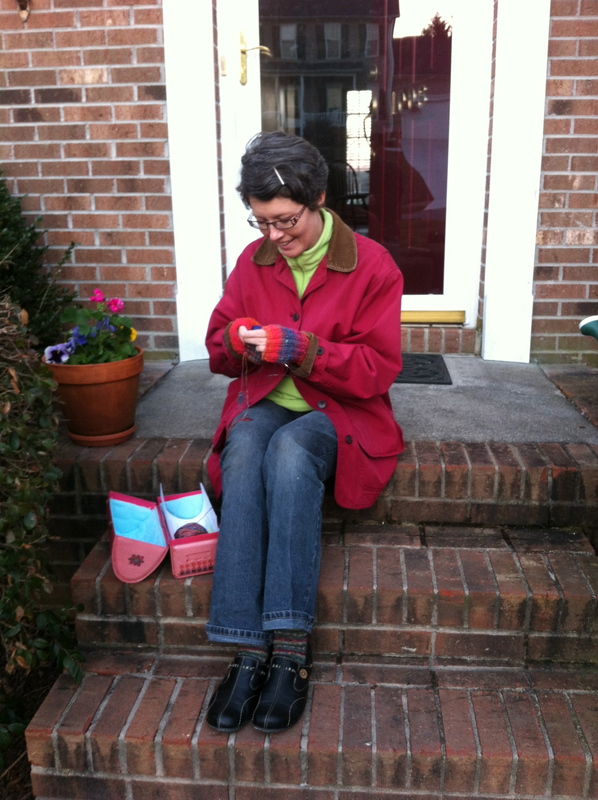 And a photo of me knitting on our front stoop. This was taken prior to being in the hospital, hoping and praying that the medications I was on would put the U.C. into remission. There’s something about this photo I like… 1. 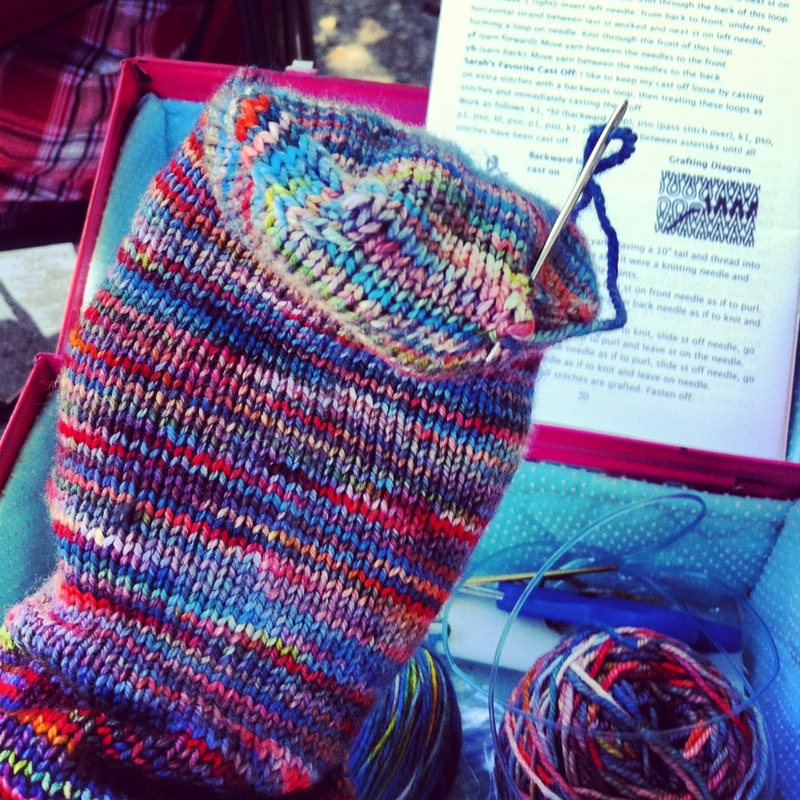 I love knitting outdoors, even if it means wearing a coat and knitted hand mitts. 2. 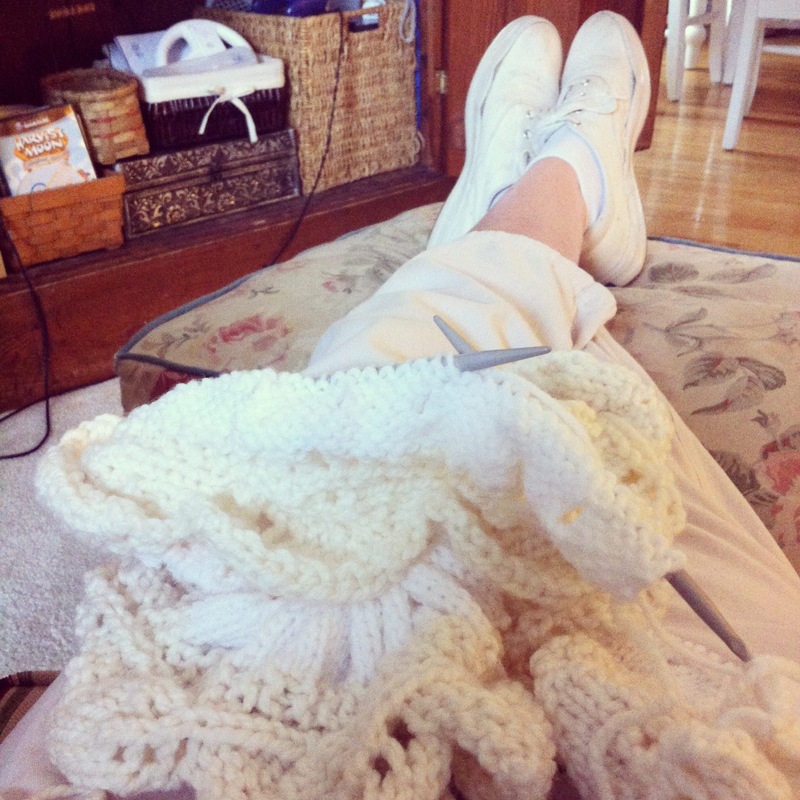 Knitting became synonymous with “hope” during my recent illness. 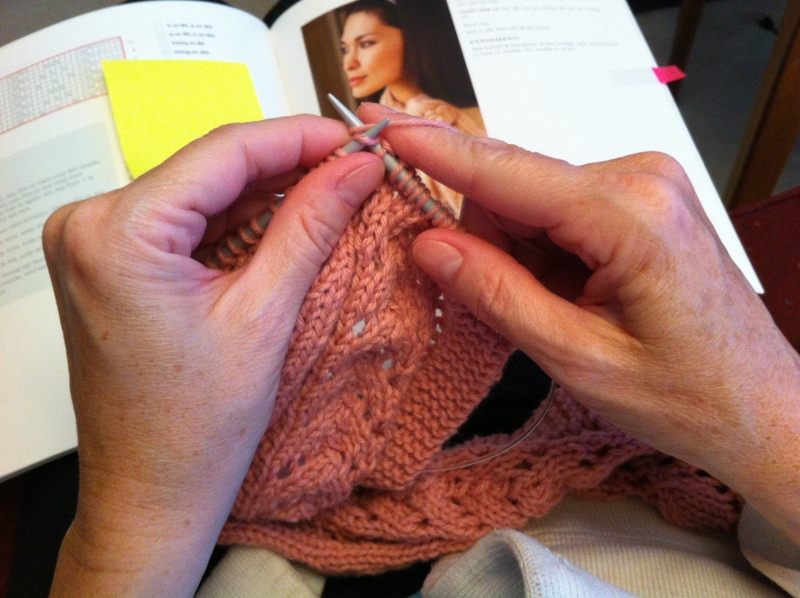 Knitting and Hope…I like that. Well, that’s enough for now…I’ll share more “knitterly notes” with you soon. I’ll be stocking the Shoppe with some new items soon…more on that coming up! **Thank you so much for visiting me here on Drawn2Life!! 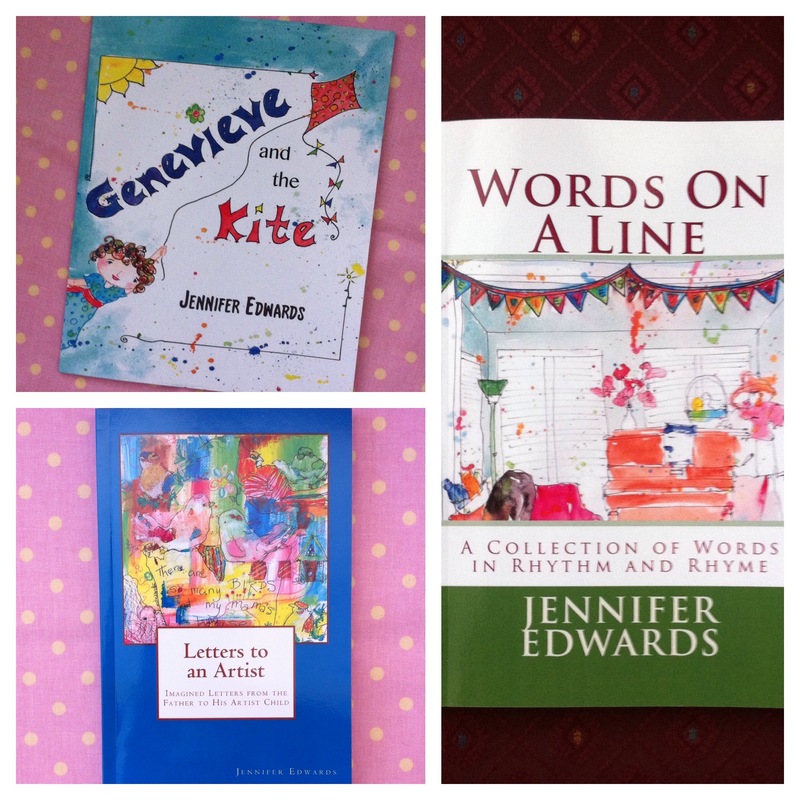 I can’t thank you enough for sharing in these creative ventures with me! 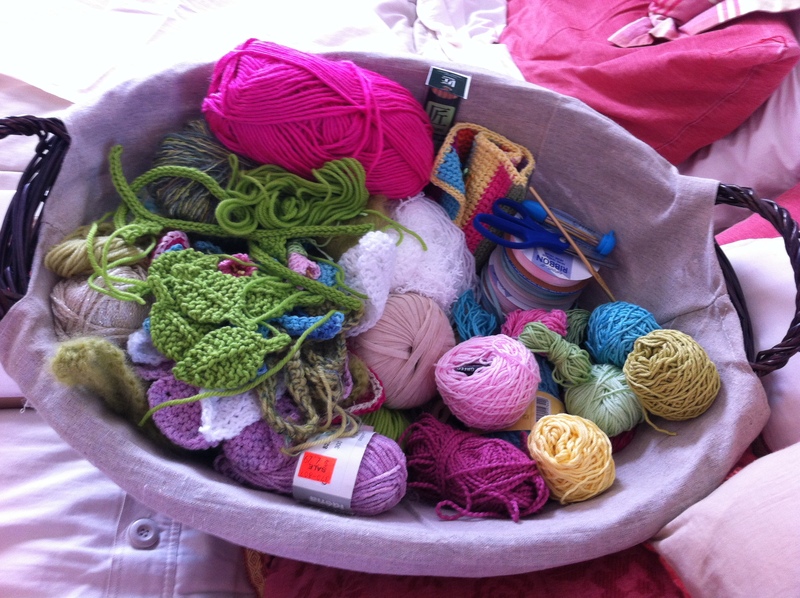 ***And…if you ever wanted to take up knitting, try my little photo tutorial HERE. I haven’t yet transferred it over from Drawn2Knit. It will happen someday. For now, check there for free patterns and tutorials. 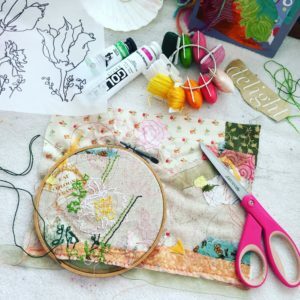 ****ANNDDD….if you’d like to try your hand at drawing/sketching OR need a little boost or encouragement to get back into it…check out my Drawing Your Life Mini Lessons. These were offered last year and still receive a lot of traffic. I hope it’s helpful to you all! I love the top painting you did! 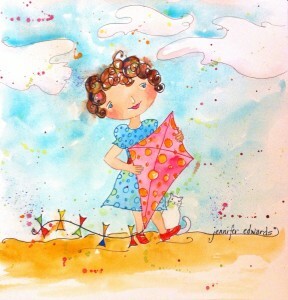 love the painting and the baby bonnet !!! I really liked seeing how you translated the photo reference. I am constantly trying to put everything in the picture but here you show the book and even the photo in the book without really doing all the detail. Very nice painting of your hands. Oh that Kitchener stitch! I simply cannot remember it so always pull out the directions. I work it with the stitches on two needles rather than dare to take the stitches off the needles to work it. I love the colors in that sock too. Colorful and bright without being too bright. 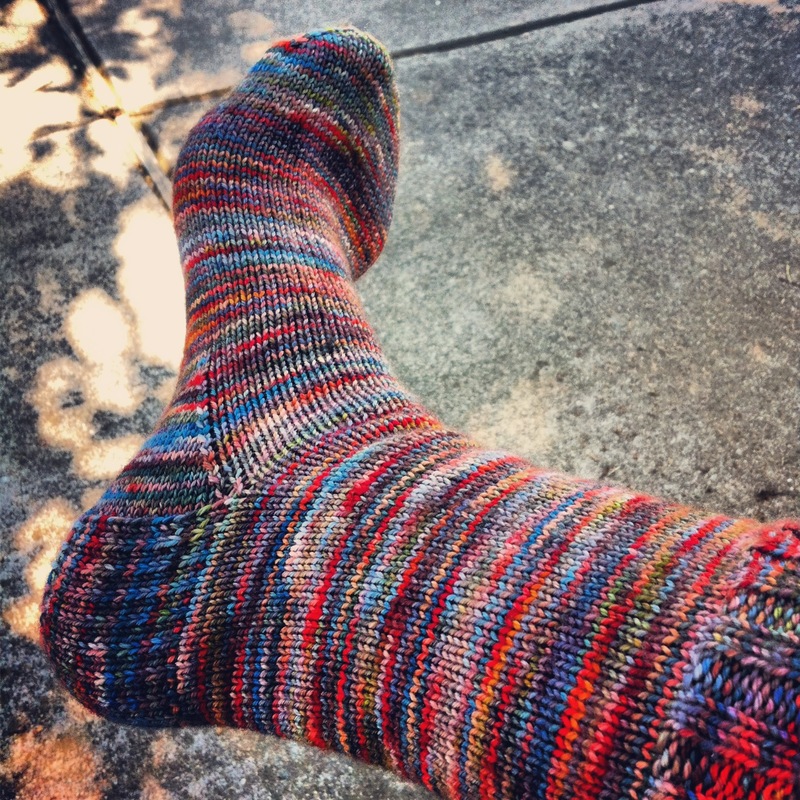 I’ve made socks that went with none of my clothes just because I liked the yarn but it’s nice when you can wear them without standing out like an upside down lighthouse beacon. 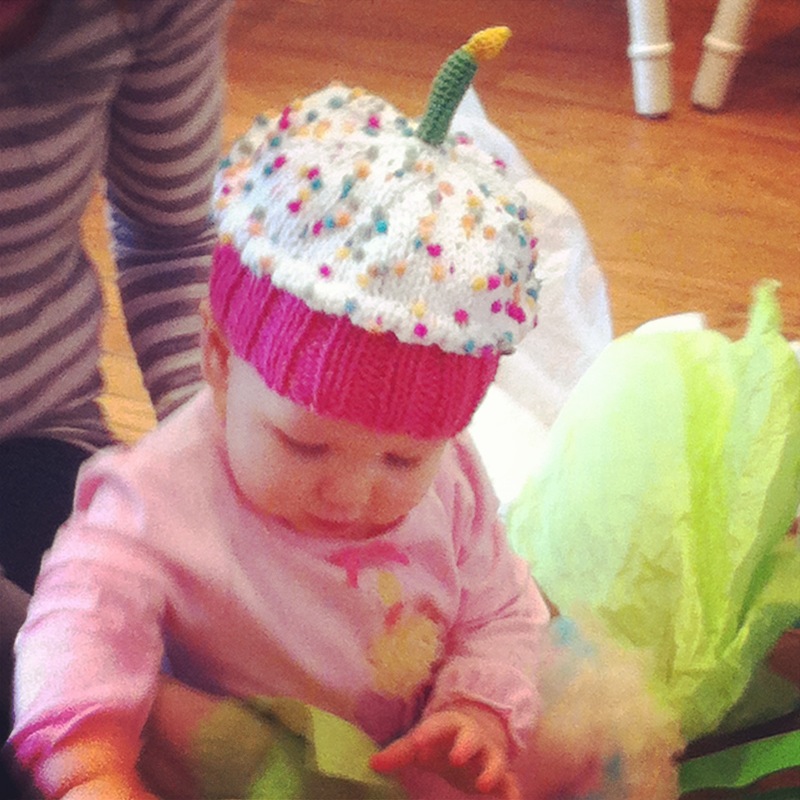 I wish my grandkids were young enough for that cupcake hat. That is so adorable as is your niece all dressed up and wearing it! The knitted cupcake hat is TOO Cute!!! What a lucky little girl to get such a gift from her auntie. 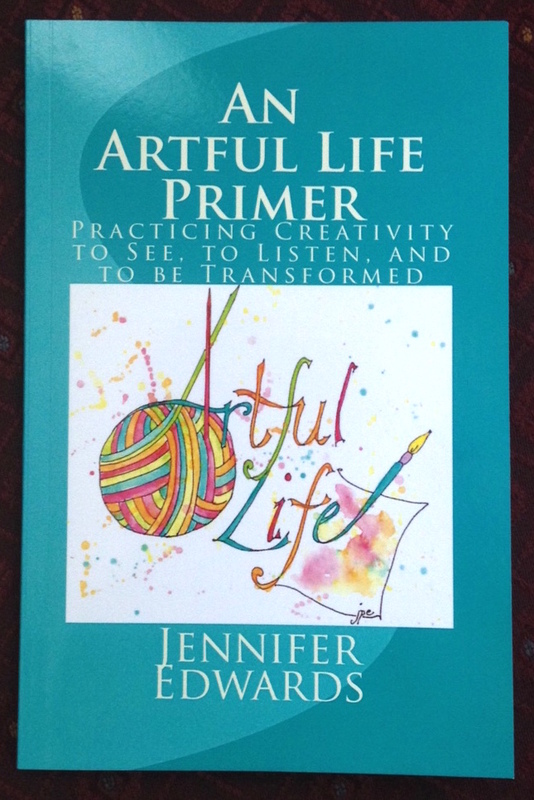 The painting of your hands knitting is beautiful and thanks for sharing the reference photo too! 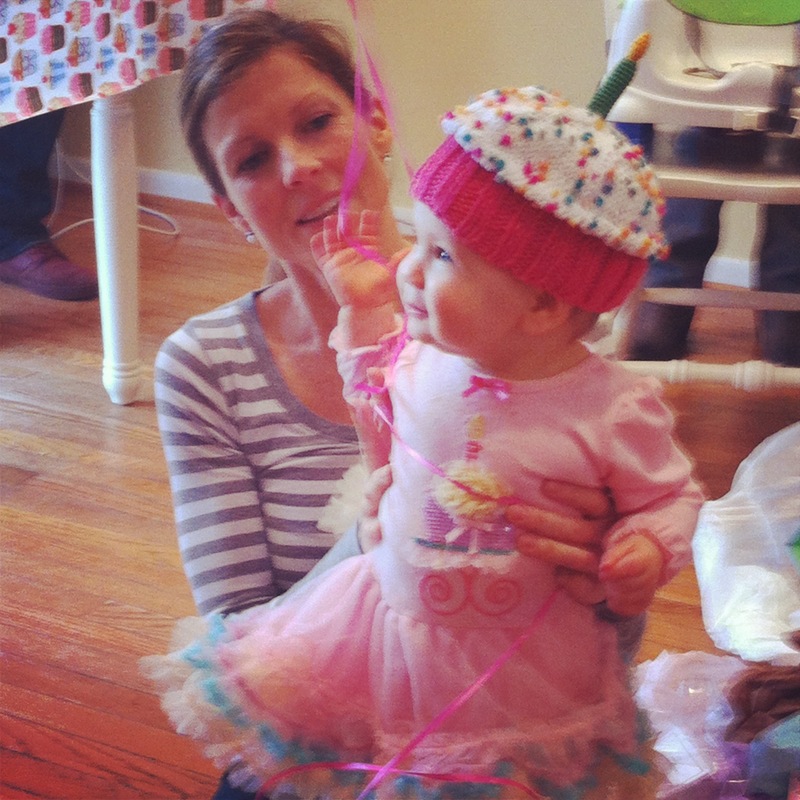 Love the cupcake birthday hat, SO cute, your niece is adorable wearing it!! Love your socks too! I’ve purchased sock yarn and needles in hopes to make a pair, but being a fairly basic/newbie at knitting I may have bitten off more than possible. We’ll see. Your post is very encouraging. Hoping you are doing well. Thank you Suzy! I do appreciate you visiting here and taking the time to comment!! All the best as you knit socks and other things!! The cupcake bonnet is a winner!! Thank you Sandra!! It sure looked cute on Brynley! That is a great painting at the top there. Hands are hard to do but you pulled it of superbly well. How are you doing now? Do you need to go back into hospital? Also, is your illness stopping you from drawing/ painting? I’m doing well, Stew! Thank you for asking! I have good days and not-so-good days. But overall there is improvement! I wish it would go faster, this healing stuff. But I am stronger each day, so I am thankful for that! I hope I don’t have to go back to the hospital for a stay! 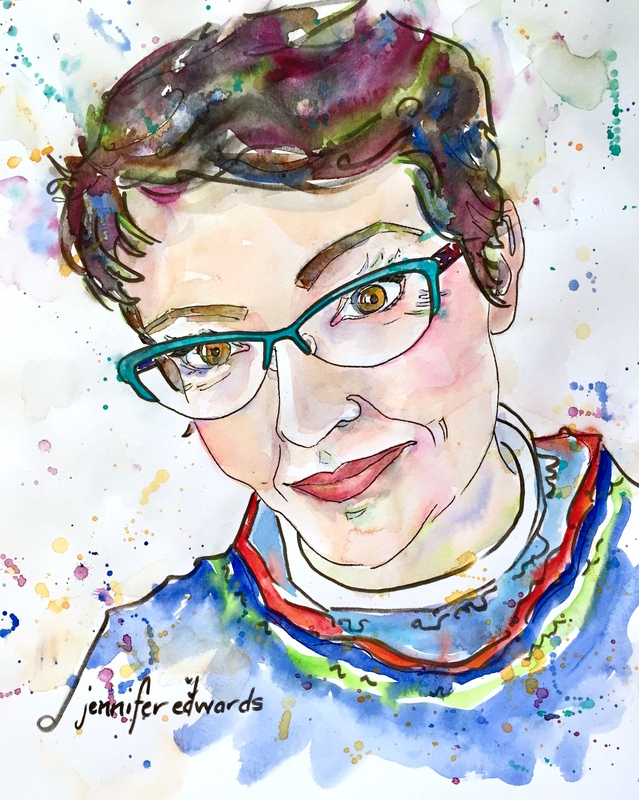 And I am back to painting and drawing and knitting…as you can see! Thank you so much for asking!! And you? How is your health? Of course, you may have a way to go and there will be ups and downs. But you will get there. I will be thinking of you the whole time. I went for the results of my recent CT scan on Monday. Not good news. The cancer has come back. So next is a meeting with the specialist and my oncologist. It looks like an operation then when I’m strong enough chemotherapy . But I won’t know if anything can be done until the meetings. I’m sure the operation will be possible. And I’m getting used to this cancer lark 🙂 I’ve beaten it twice before, I’ll beat it again. 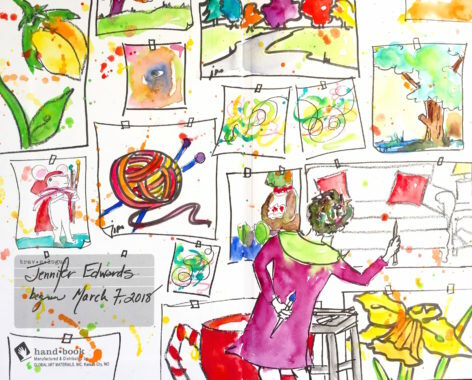 Keep drawing and painting – it helps a lot. Oh Stew…I am very very sorry to hear this! Gracious! You have been through a lot and now you face more. I will be in much prayer for you. My mom is a multiple cancer survivor: first metasticised melanoma, then ovarian, and just last summer breast cancer. She will be praying for you too. Gracious…I am truly sorry you have to endure this! I love your knitting – beautiful! Reminds me of my grandmother, who would knit. I still have a shawl she made (though it is somewhat worse for the wear because about two decades ago I stupidly put it in the washer. I need a master knitter like you to fix it. But it is still precious to me. The cupcake is so creative! Great drawing/watercolor of the knitting hands. I am greatly relieved that it is from a photo, as otherwise you would have four hands. I love activities that put us in the “zone”. So it is certainly a great photo of you on the stoop. I love your beautiful knitting Jennifer. And the painting too! Get well soon. Sending healing energy your way. I’ve been thinking about your Mum – I hope she is feeling better. And of course, I’m hoping you are feeling better too.